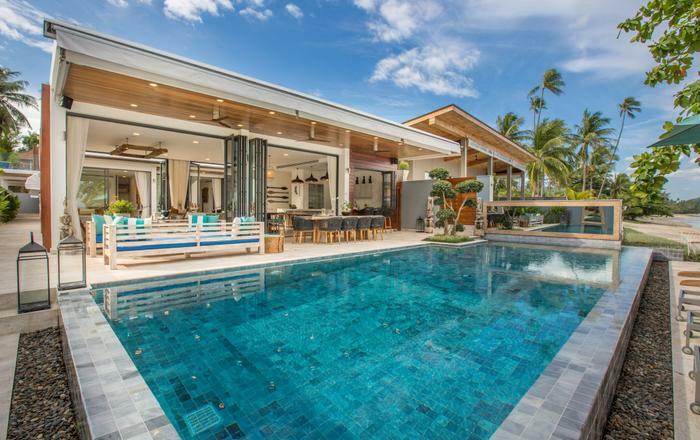 Villa Fah Sai blends the striking contemporary design elements of Frank Lloyd Wright with the refined comforts of a luxury tropical retreat. 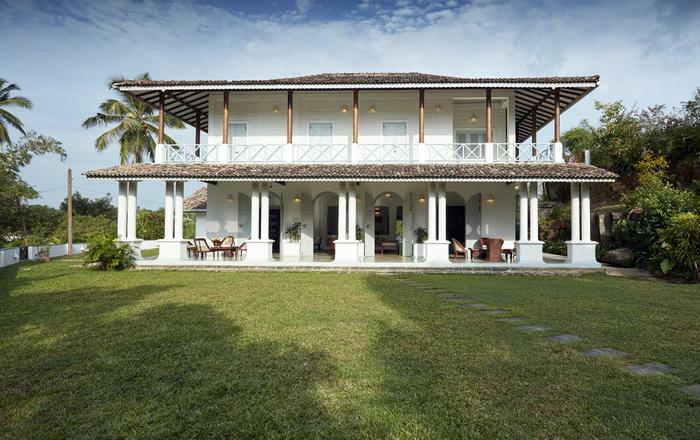 Having formerly graced the pages of The New York Times as one of its "Great Homes of the World" this is a truly unique and elegant seaside residence. 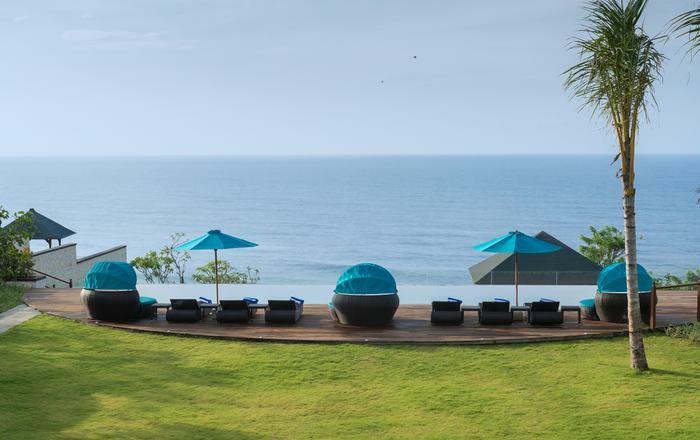 Making the most of its majestic location Villa Fah Sai utilizes strong horizontal lines to provide uninterrupted panoramic sea views from all of its spacious rooms. The grand entrance opens into a wide living room, the space naturally bright thanks to the sunlight pouring in through the panelled glass facade, which can be opened to draw in the balmy ocean breeze. 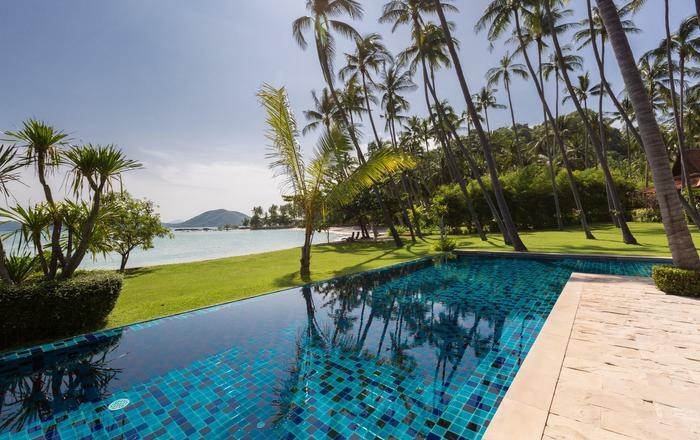 A plush, oversized sofa provides front row seats to gaze over an onyx-tiled reflecting pond that seamlessly melts into Naka Lay Bay and the shimmering Andaman Sea beyond. The villa's crowning feature is the expansive lower level poolside veranda wrapped around the enticing 18-meter fresh water infinity pool. 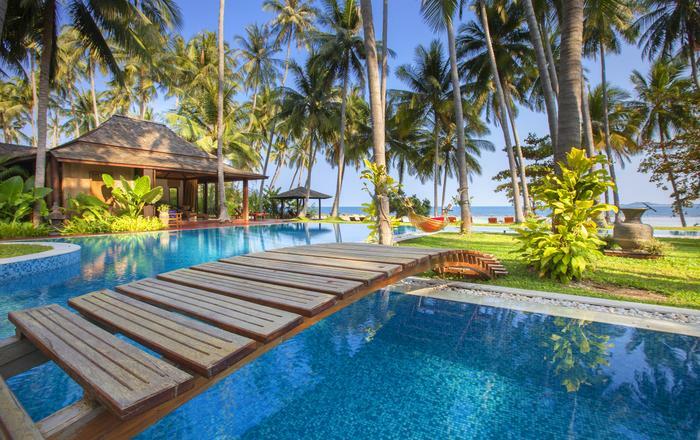 This is the perfect place to congregate for a sunset cocktail or to simply read your book between refreshing dips. The pool also has a shallow end for youngsters making it a place the whole family can enjoy. Walking through the main atrium, an elegant dining area leads into a bright kitchen, the latter fully equipped with the latest gourmet appliances. Casual bites can be enjoyed in a cozy built-in breakfast nook while an adjoining terrace provides diners with a tempting alfresco option, all with jaw-dropping sea views. Meal times are a breeze as the in-house chef will take care of everything, simply choose your menu from the wide range of options and sit back, relax and enjoy. 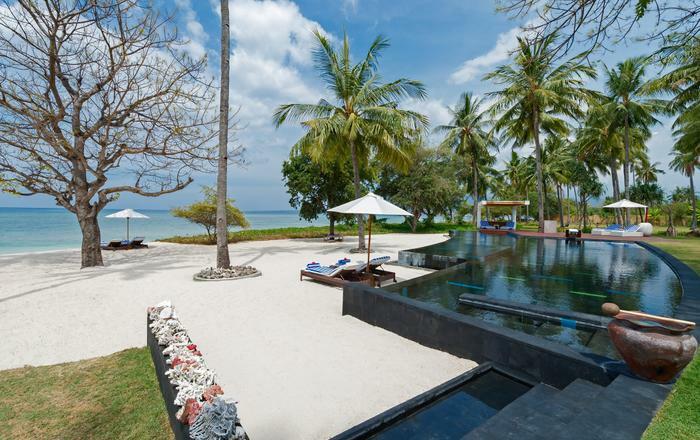 Villa Fah Sai is designed with guest entertainment in mind. There is a games room equipped with 40" wall mounted LCD TV + DVD and an Xbox 360 making it a great spot for guests to gather and unwind. If your feeling active a treadmill is also stationed in this room, strategically positioned to make the most of the alluring sea views. For a bit luxury leisure one of the bedrooms on the lower level can also be converted into a home spa with professional therapists on call to administer treatments. And, an indoor Jacuzzi adds another option for an indulgent escape. As the day winds down guests can retire into one of five private bedrooms, each one designed as a personal retreat complete with ensuite bathroom. These spacious intimate sanctuaries are bedecked in high quality furnishings to offer a great night's sleep and with four opening onto the villa's poolside verandah you'l feel immersed in the breezy natural surroundings at all times. Arrived at the Villa to meet the very friendly staff who showed us through the spacious and beautiful upstairs lounge & hall area to our walk in pool side rooms overlooking the sea & beach - first impressions WOW! 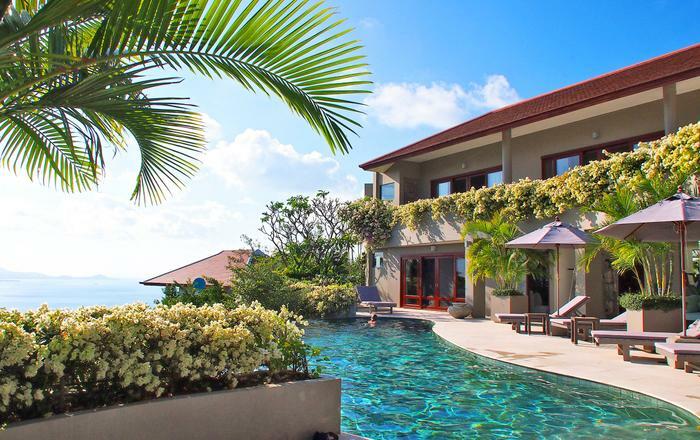 Large infinity swimming pool with great views, rooms immaculate with own on suite bathroom & all amenities provided. Sauna present along with downstairs lounging area with a huge TV along with a treadmill... Coffee & breakfast both mornings was provided by the friendly staff along with the offer of beer! Was very impressed with my whole experience & can say would definitely stay with John again 5 stars! Thank you so much for everything. This was the best vacation ever, and the food was so delicious every day. You both made our visit unforgettable. Thank you so much for everything! The villa was beautiful, the food was amazing and your hospitality was way more than any of us could have asked for. To the Villa 8 staff, My sincere appreciation for your overwhelming kindness, joy and hospitality is hard to put into words. It is rare in this world to meet people with hearts as big as yours. Thank you so much. To the staff, Thank you so much for the amazing food and hospitality. The stay here was world class. Relaxing, fun, happy, amazing! What a memorable Christmas and New Year's. Thanks to all of you that worked so hard and always with a smile on your face. Juree, John, Boy, Om and Na - you will forever be in our hearts. Health and happiness to all your families. We spent four happy and lovely days at the villa. We are happy to have been served with special care and would like to come back on our next trip. A special thank you to you guys. We spent five amazing days at the villa. A special thank you to Om, Boy, and Juree for making our stay extra special. We had great food, enjoyed the views and the incredible villa. Thanks also to John for everything. Bedroom 2 acts as a second master suite; Bedroom 5 can be converted into a home spa when the villa is under-occupied.